This is the first time that I've seen a bible with coloring pages in it. 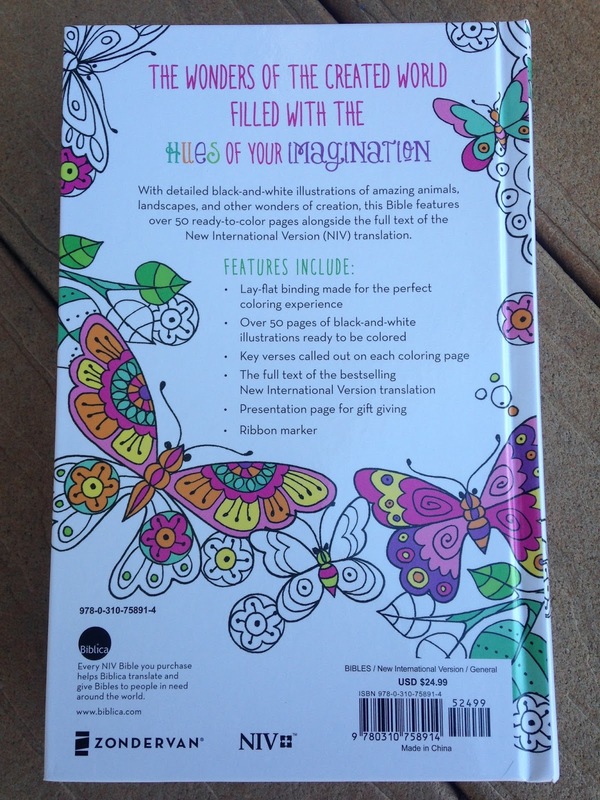 I mean I have used a journaling Bible, but one with coloring pages? Nope! So this is definitely a first for me. 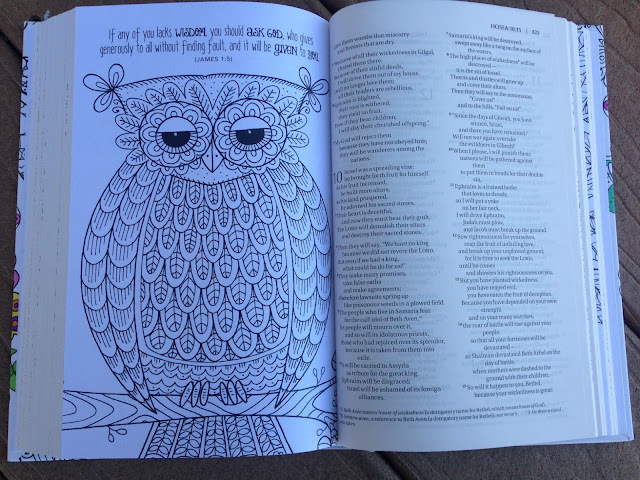 I was actually curious how there could be coloring pages in the Bible because, well, coloring pages are usually printed on nice thick quality paper, and the Bible pages are usually much thinner than that. So I was curious how this would work. The first thing I did when I received this Bible for review was to look at the pictures. They are truly lovely. Not too detailed to be frustrating to color, but also not boring. The images are typical of the adult coloring books that are seemingly everywhere today. Each picture also has a Bible verse printed on it. 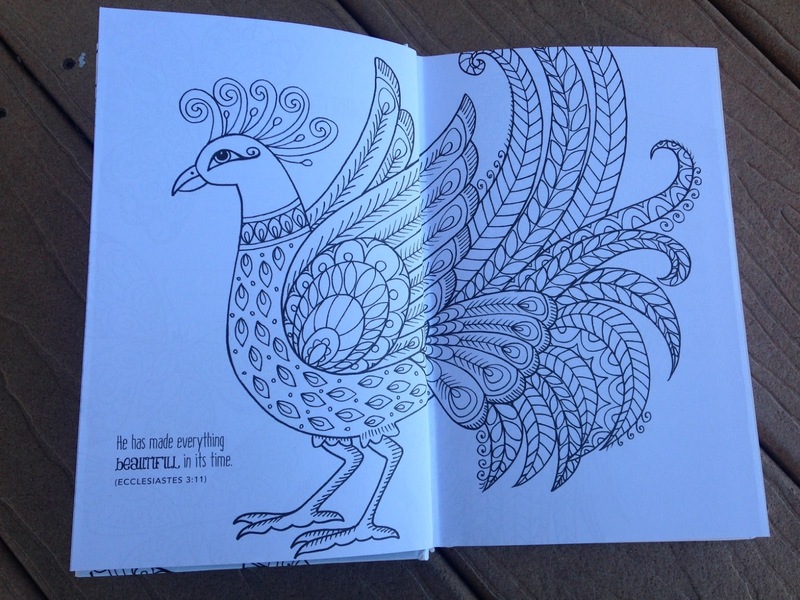 Coloring is a great way to meditate on what you have learned or read in the scripture. In total there are over 50 pages of illustrations waiting to be colored. Some of the pages feature double page spreads to color and others are single pages, which face the Bible portion on the opposite page. This Bible also contains the entire text of the NIV version of the Bible. It is a nice slim size with a hard cover and a ribbon page marker. It would fit nicely inside a medium sized purse or bag with plenty of room for markers or colored pencils. I would personally choose to color these pictures with gel pens. The binding lays nice and flat for easy coloring and the hard cover makes a nice solid surface to use while coloring as well.